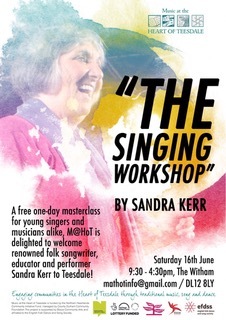 The Music at the Heart of Teesdale project (M@HoT) is offering a free one day singing workshop for young musicians, run by renowned folk singer/songwriter Sandra Kerr. The masterclass, which is open to any young person aged 11 to 18 years, will take place on Saturday, August 16, at The Witham, Barnard Castle, from 9.30am till 4.40pm. “Thanks to funding secured from the Northern Heartlands project, we are able to offer this wonderful opportunity to young people in Teesdale completely free!” said M@HoT’s retiring project coordinator Neil Diment. 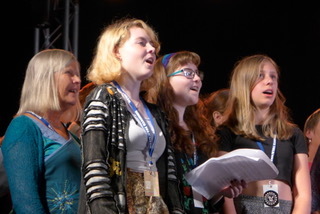 “Some of our young Cream Tees musicians sang in her choir at Sidmouth Festival when we took our youth folk band there last summer and it is really thanks to them that this invitation came about. M@HoT’s Researcher, Mike Bettison agreed. 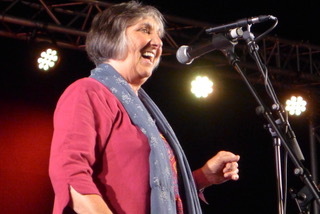 “Sandra has been absolutely instrumental in raising the popularity of folk and community choirs in the UK and has been running the choir at Sidmouth folk festival since the 1980s. Older readers will of course forever associate her name with Bagpuss, the very popular children’s TV series from the 1970s. But Sandra was also part of the folk revival back then and sang in a group with Ewan MacColl and Peggy Seeger.